When I was planning my trip to Santa Marta, my thought process was that I was going to spend it at the beach. Little did I know that the real adventure would be in getting to the beach. From Santa Marta, I took a busseta to Tayrona, costing 7000 pesos. I figured I’d just go in, get a map, and with a quick hike I’d be at the beach. Wrong. 1. Get there early in the morning. Anyone who knows me knows I am not a morning person. As in, can’t-function-before-noon kind of not morning person. For this reason, I didn’t arrive at the park until about 12:30. I did not know that Tayrona has specific park hours, and if you’re not staying overnight, you’re booted by 5 PM. After I got in and paid the hefty entrance fee, almost 50,000 pesos for an adult day pass, I took the shuttle for another 3000 pesos to Canaveral. On my shuttle I met a rowdy group of Canadians who I decided to continue on with, and we chose horses as our mode of transport to the beach. When I got to San Juan, I rushed out onto the beach. While it is one of the most crowded beaches at Tayrona, there’s good reason behind that. It’s stunning. White beaches, clear water, and a small hill with a hammock hut on top overlooking the majestic views. The water is nice but be warned it gets deep very quickly! 3. Explore the hill at San Juan. Lay in a hammock and listen to the lull of the ocean as you appreciate the wonders of the world and the fact that you are in one of the most beautiful national parks. Laying up there has an effect on you, and it’s one of the best places to appreciate the beauty from. After a few hours laying on the beach and ducking under waves, I had to leave because unfortunately, I had not planned on staying overnight. 4. Stay overnight. I wasn’t able to and regret it! One day at the park simply isn’t enough. I can’t say how comfortable the tent camping is, but it’s easy, accessible, and not too expensive. You can camp right at San Juan! Imagine waking up to the sound of the natural park, and getting able to go right back to exploring as soon as you’re awake! It was recommended to me that I take one of the boats from San Juan beach back to Taganga, which is a 50 min boat ride and costs 55,000 pesos. With this option, you are able to depart at 4 PM. If you were hiking out, you would need to leave by 3 PM because it’s about a two hour hike back to the entrance. If you take horses, you can leave at 5 PM because they will get you out the fastest. The boat didn’t actually end up leaving until 4:30 (Colombian time of course), at which point my Canadian friends had finally caught up to me, finding no broken bones or major injuries in the guy that fell off. I hung with them until my boat departed, which was quite the process. 5. Be cautious if taking the boats. If you get seasick, this is not for you. To get on the boat, they first load everyone’s bags (which means no camera for the trip, unless you have a waterproof!) into the front and then the people, using a painting ladder. It’s about 40 people on the boat, and the ride is 50 minutes long. The beginning is quite pleasant, with beautiful views of the park and beaches. We even saw a few dolphins! But then, the other 40 minutes is just looking out at the same mountains and trees, begging yourself not to get seasick. The strong smell of gasoline coming from the motors does not help. You also get really wet on this boat trip, and it randomly speeds up and slows down, so you never know when you’re going to get a face full of water. We did get to witness a spectacular sunset, the sun literally burned red in the sky, and everything around us was shaded in pink. It was incredible. Too bad I couldn’t snap a photo. The last 20 minutes of the boat ride I swear was just water coming over the side. It was like a water park. Except by now it was getting dark, and windy, and we were cold. My clothes climbed to my skin, and I had to wrap my arms around myself for warmth. The last 10 minutes was by far my worst time in a while. 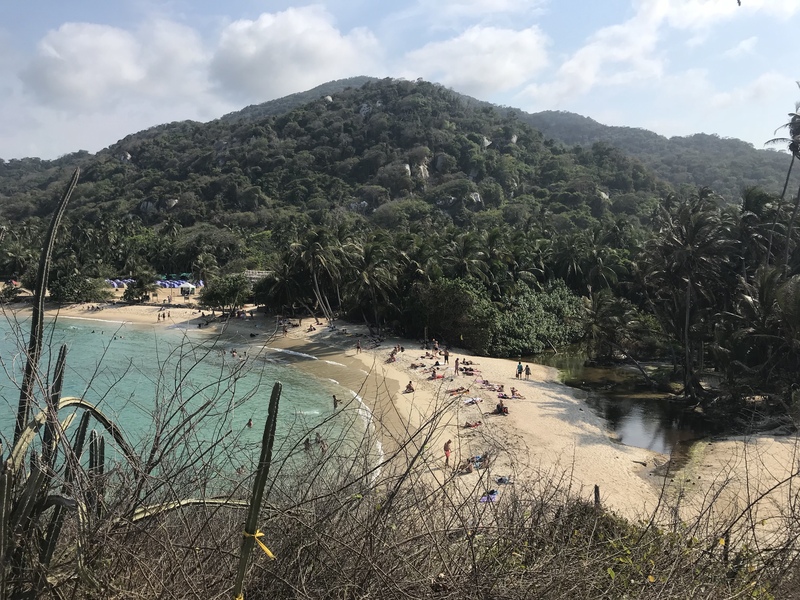 But as soon as we were off the boat, I felt fine again and grateful for the chance to see the entire coastline of Tayrona, even if I had to cover my mouth a few times. We got off at the beach at Taganga, where you can easily take a busseta back to Santa Marta for 1600 pesos. I was able to get dropped off right by my hostel, Republica Hostel Santa Marta, right near Simón Bolivar Park. Great location, great food, great atmosphere; I highly recommend! Overall, my experience at Tayrona Nacional Natural Parque was unforgettable, and I definitely plan on coming back (and staying overnight!). It really has a natural beauty, and it’s astounding to see and experience for yourself. Next up, Minca! (I’ve started using my middle name while traveling to avoid having to pronounce my first a few million times).